Double-sided, 4'' x 4'' cards. 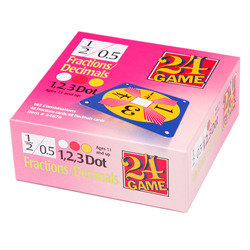 Deck contains 48 Fractions 1 Dot, 2 Dot and 3 Dot cards, 48 Decimals 1 Dot, 2 Dot and 3 Dot cards. Three levels of challenge. Cards and offer three levels of difficulty. Easy, 1 Dot cards are easy, 2 Dot cards are medium and 3 Dot cards are tough. How to play Fractions/Decimals. Object of the game is to make 24. You can add, subtract, multiply and divide. Use all four numbers on a card, but use each number only once. There is at least one solution to every card.